This article is about the city. For the nuclear disaster, see Chernobyl disaster. 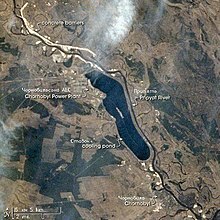 For the nuclear power plant, see Chernobyl Nuclear Power Plant. For other uses, see Chernobyl (disambiguation). Chernobyl (/tʃɜːrˈnoʊbəl/) is a city in the restricted Chernobyl Exclusion Zone situated in the Ivankiv Raion of northern Kyiv Oblast, near Ukraine's border with Belarus. Chernobyl is about 90 kilometres (56 mi) northeast of Kyiv, and approximately 140 kilometres (87 mi) southwest of the Belarusian city of Gomel and 16 km [10 mi] from Ukraine’s border with Belarus. The city was the administrative center of Chernobyl Raion (district) from 1923 until it was disestablished in 1988. Before its evacuation, the city had about 14,000 residents. The city was evacuated on 27 April 1986, 30 hours after the Chernobyl disaster at the Chernobyl Nuclear Power Plant which was the most disastrous nuclear accident in history. The power plant was within the Chernobyl Raion district. Pripyat, a city of 50,000 people and closer to the power plant than Chernobyl, had been built in the 1970s as a home for the power plant workers. 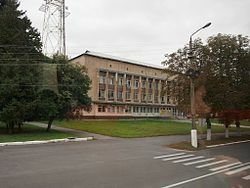 After the accident, administration of the Chernobyl Raion district was transferred to the neighboring Ivankiv Raion. The city of Slavutych, built for those evacuated from Pripyat, received the population evacuated from Chernobyl. Today Chernobyl is mostly a ghost town, but a small number of people still reside in houses marked with signs stating: "Owner of this house lives here". Workers on watch and administrative personnel of the Chernobyl Exclusion Zone are stationed in the city on a long-term basis. There are two general stores and a hotel for tourists. The city's name is the same as a Ukrainian name for Artemisia vulgaris, mugwort or common wormwood, which is Ukrainian: чорнобиль, translit. chornóbyl’ (or more commonly Ukrainian: полин звичайний, translit. polýn zvycháynyy, lit. 'common artemisia'). The name is inherited from Proto-Slavic *čьrnobylъ or Proto-Slavic *čьrnobyl, a compound of Proto-Slavic *čьrnъ 'black' + Proto-Slavic *bylь 'grass', the parts related to Ukrainian: чорний, translit. chórnyy, lit. 'black' and Ukrainian: било, translit. byló, lit. 'stalk', so named in distinction to the lighter-stemmed wormwood A. absinthium. Chernobyl was originally part of the land of Kievan Rus′. The first known mention of Chernobyl is from an 1193 charter, which describes it as a hunting-lodge of Knyaz Rurik Rostislavich. In the 13th century, it was a crown village of the Grand Duchy of Lithuania. The village was granted to Filon Kmita, a captain of the royal cavalry, as a fiefdom in 1566. The province where Chernobyl is located was transferred to the Kingdom of Poland in 1569, and later annexed by the Russian Empire in 1793. Prior to the 20th century, Chernobyl was inhabited by Ukrainian, some Polish peasants and a relatively large number of Jews. Jews were brought to Chernobyl by Filon Kmita, during the Polish campaign of colonization. After 1596, the traditionally Eastern Orthodox Ukrainian peasantry of the district were forcibly converted, by Poland, to the Greek Catholic Uniate religion. Many of these converts returned to Eastern Orthodoxy after the Partitions of Poland. In 1626, during the Counter-reformation, the Dominican church and monastery were founded by Lukasz Sapieha. A group of Old Catholics opposed the decrees of the Council of Trent. [clarification needed] In 1832, following the failed Polish November Uprising, the Dominican monastery was sequestrated. The church of the Old Catholics was disbanded in 1852. In the second half of the 18th century, Chernobyl became a major center of Hasidic Judaism. The Chernobyl Hasidic dynasty had been founded by Rabbi Menachem Nachum Twersky. The Jewish population suffered greatly from pogroms in October 1905 and in March–April 1919; many Jews were killed or robbed at the instigation of the Russian nationalist Black Hundreds. When the Twersky Dynasty left Chernobyl in 1920, it ceased to exist as a centre of Hasidism. Chernobyl had a population of 10,800 in 1898, including 7,200 Jews. Chernobyl was occupied in World War I[by whom? ]; Ukrainians and Bolsheviks fought over the city in the ensuing Civil War. In the Polish–Soviet War of 1919–20, Chernobyl was taken first by the Polish Army and then by cavalry of the Red Army. From 1921 onwards, it was incorporated into the Ukrainian SSR. Between 1929 and 1933, Chernobyl suffered from killings during Stalin's collectivization campaign. It was also affected by the famine that resulted from Stalin's policies. The Polish and German community of Chernobyl was deported to Kazakhstan in 1936, during the Frontier Clearances. During World War II, Chernobyl was occupied by the German Army from 25 August 1941 to 17 November 1943. The Jewish community was murdered during the Nazi occupation of 1941–44. Twenty years later, the area was chosen as the site of the first nuclear power station to be built on Ukrainian soil. The Duga over-the-horizon radar array, several miles outside of Chernobyl, was the origin of the Russian Woodpecker; it was designed as part of an anti-ballistic missile early warning radar network. With the dissolution of the Soviet Union in 1991, Chernobyl remained part of Ukraine. A grocery store in Chernobyl. The words on the window read "Café Bar" as "Кафе Бар"
On 26 April 1986, Reactor No. 4 at the Chernobyl Nuclear Power Plant exploded after tests were done on the reactor improperly and the operators lost control. This was due to a design flaw of the RBMK reactor, which made it unstable when operated at low power. Chernobyl city was evacuated soon after the disaster. The base of operations for the administration and monitoring of the Chernobyl Exclusion Zone was moved from Pripyat to Chernobyl. Chernobyl currently contains offices for the State Agency of Ukraine on the Exclusion Zone Management and accommodations for visitors. Apartment blocks have been repurposed as accommodations for employees of the State Agency. The length of time that workers may spend within the Chernobyl Exclusion Zone is restricted by regulations that have been implemented to limit radiation exposure. The city has become overgrown and many types of animals live there. According to census information collected over an extended period of time, it is estimated that more mammals live there now than before the disaster. Although Chernobyl will remain uninhabitable for thousands of years due to elevated levels of background radiation, guided tours of the exclusion zone are possible. In 2003, the United Nations Development Programme launched a project, called the Chernobyl Recovery and Development Programme (CRDP), for the recovery of the affected areas. The program, initiated in February 2002, based its activities on the Human Consequences of the Chernobyl Nuclear Accident report recommendations. The main goal of the CRDP's activities is supporting the efforts of the Government of Ukraine to mitigate the long-term social, economic, and ecological consequences of the Chernobyl disaster. CRDP works in the four areas of Ukraine that have been most affected by the Chernobyl nuclear accident: Kiev Oblast, Zhytomyrska Oblast, partially Kyiv, Chernihivska Oblast, and Rivne Oblast. Chernobylite is the name cited by two media sources for highly radioactive, unusual and potentially novel crystalline formations found at the Chernobyl power plant after the meltdown. These formations were found in the basement below Reactor No. 4 during an investigation into missing reactor fuel. ^ Mould, Richard. "Evacuation zones and populations". Chernobyl Record. Bristol, England: Institute of Physics. p. 105. ISBN 0-7503-0670-X. ^ Withington, John (13 December 2013). Disaster! : A History of Earthquakes, Floods, Plagues, and Other Catastrophes. Skyhorse Publishing Company, Incorporated. p. 328. ISBN 978-1-62636-708-1. ^ a b Etymology from O. S. Melnychuk, ed. (1982–2012), Etymolohichnyi slovnyk ukraïnsʹkoï movy (Etymological dictionary of the Ukrainian language) v 7, Kyiv: Naukova Dumka. ^ Chernobyl ancient history and maps. ^ Davies, Norman (1995) "Chernobyl", The Sarmatian Review, vol. 15, No. 1. ^ "The History Place - Genocide in the 20th Century: Stalin's Forced Famine 1932-33". www.historyplace.com. Retrieved 2018-11-16. ^ Brown, Kate (2004). A Biography of No Place: From Ethnic Borderland to Soviet heartland. Cambridge, Mass. : Harvard University Press. ISBN 0674011686. OCLC 52727650. ^ 1957-, Plokhy, Serhii,. Chernobyl : the history of a nuclear catastrophe (First ed.). New York, NY. ISBN 9781541617094. OCLC 1003311263. ^ 1970-, Schmid, Sonja D.,. Producing power : the pre-Chernobyl history of the Soviet nuclear industry. Cambridge, Massachusetts. ISBN 9780262321792. OCLC 904249268. ^ "BBC News – Chernobyl – Containing Chernobyl?". news.bbc.co.uk. ^ "Alsos: Suicide Mission to Chernobyl". alsos.wlu.edu. Wikimedia Commons has media related to Chernobyl. Look up chernobyl in Wiktionary, the free dictionary. United Nations Chernobyl Recovery and Development Programme See the actions of the Chernobyl Recovery and Development Programme towards Chernobyl-affected area and its population. Nuclear Downturn: How Can Fukushima and Chernobyl Compare and Contrast?